The Lincoln Electric Precision TIG 375 Stick and TIG Welder features an advanced control panel with a TIG pulser that allows you to control the heat input for any weld. It provides up to 375 Amps at a 40% duty cycle with a total range of 2 - 420 Amps, making it great for fabrication, aerospace, motorsports and vocational education. Micro-Start II technology delivers extremely stable low-amperage starting, welding and cratering for both AC and DC welding, and convenient onboard storage is provided for consumables. 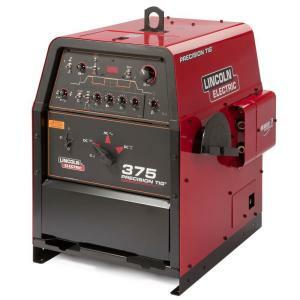 Tbook.com crawls the web to find the best prices and availability on Welders and related Tools and Hardware products like Lincoln Electric 420 Amp Precision TIG 375 TIG Welder, Single Phase, 230V/460V/575V. For this page, related items include products we find that match the following keywords: "Welder|Welding" at our vendor partner Home Depot. Lincoln Electric 420 Amp Precision TIG 375 TIG Welder, Single Phase, 230V/460V/575V is one of 184 Welders and related products listed in the Tools and Hardware section of Tbook.com If you have any questions on this product, please give us a call at 734-971-1210 during the hours of 9am - 5pm EST for assistance. Thank you for shopping at Tbook.com, the Internet Department Store!